A congratulatory document signed by Senator Hall can be provided in recognition of special events such as birthdays, graduations, wedding anniversaries, Eagle Scouts' Court of Honor, church anniversaries. A resolution signed by the Senator and Secretary of the Senate can be provided to recognize a significant accomplishment or to remember someone who has passed. Please click the contact below. 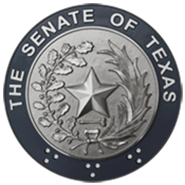 Additionally, a list of helpful phone numbers and websites for select Texas government agencies can be accessed here.